Castilla y Leon has 23 public hospitals of which 15 have installed solar thermal panels that have saved the regional coffers some 1.5 million euro in ten years. This initiative is part of the Hospisol program and these panels, placed on almost 4,000 square meters of hospitals rooftops provide hot water. The Regional Department of Economy and Finance, through the Regional Authority for Energy (EREN) and in collaboration with Sacyl, manages the program Hospisol consisting in placing solar panels on the roofs of public hospitals in the Community for hot water production. The initiative began in late 2004 and a decade later has reached 15 of the 23 hospital complexes of the Junta, where the installation of almost 4,000 square meters of this type of solar panels has saved 1.5 million euro in fuel fossils. First, this program helps to improve the quality of the environment, which is one of the principles guiding the actions of the Junta. The economic factor must be added to this, since the EREN sells clean and sustainable energy produced by the solar panels to Sacyl at a discount over the price it would cost to produce with conventional natural gas or diesel boilers. Finally, with these revenues the EREN amortizes the cost of the facility, which are transferred at that very moment to hospitals. It is therefore a success model to the extent that health complexes benefit from significant energy and cost savings without being required to assume neither the technical responsibility nor the cost of investment and, while at the same time they reduce their dependence on fossil fuels. Hence, this project of the Regional Energy Agency of Castilla y León has been awarded the European Award 2008 for the Best European Energy Service Project in the Public Sector. This management system requires the EREN to ensure proper operation and maintenance of solar thermal systems, since the more energy production is achieved, the more is invoiced to the hospital, and the more the hospital saves, the installation is amortized in less time and more CO2 emissions are avoided. Choosing this type of health centers for the project was based on their suitability, since they are large consumers of hot water, have large and accessible rooftops for the installation of the solar collectors and therefore have an excellent access to the sun. Furthermore they are an important showcase of this technology, as far as their users include much of the population. 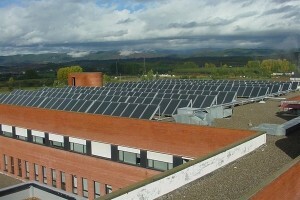 All this involves the challenge of making facilities with many solar panels, the largest, located in the hospital of El Bierzo in Ponferrada is about 600 square meters which, by economy of scale, results in lower costs per panel unit. To date, 3,889 square meters of solar thermal panels have been installed in 15 of the 23 public hospitals of Castilla and Leon, with an investment of 2.18 million euro. Specifically, they are located in the complexes of El Bierzo, Ponferrada, Leon; Nuestra Señora de Sonsoles in Avila; County of Medina del Campo, in Valladolid; Santos Reyes, in Aranda de Duero; General, in Segovia; Virgen de la Concha, in Zamora; Leon; Virgen del Castañar, Bejar, Salamanca; Santiago Apóstol , in Miranda de Ebro, Burgos; Santa Bárbara, Soria; Rio Carrión, Palencia; Divino Vallés, in Burgos; Los Montalvos, in Salamanca; Fuente Bermeja, in Burgos, and University Hospital Rio Hortega of Valladolid.